The potential surge in industrial demand for platinum should Donald Trump enter the White House could give platinum investors a boost. Tensions with Saudi Arabia spell potential disaster for the U.S. dollar, and historically gold soars when the dollar loses value. 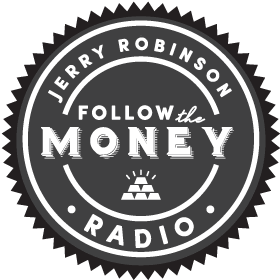 Listen in as the real estate mogul and oil/gas investor explains to Jerry Robinson why he believes the biggest stock market crash in history could likely begin this year — and how he is preparing his own financial house. Author/investor Gianni Kovacevic discusses his new book, “My Electrician Drives A Porsche?”, and provides one very simple way for investors to profit from the global boom in renewable energy. Are You Prepared for a Bank Bail-In? The big banks are preparing to feast upon the richest nations… including the bankrupt U.S.
Popular economist Jim Rickards asserts that a time will come, sooner rather than later, when there will be panic buying of gold, and only big players will be able to buy any gold at all. Our latest sector ETF selection for Q2 is now online. The U.S. Mint projects first quarter Silver Eagle sales of 15 million, the highest ever. Tom Cloud explains how this and other key factors are impacting the price of silver. A historically high ratio can often spell a major uptick in the price of silver, as seen in this gold silver ratio graph. Also, listen as Tom Cloud explains what this ratio means for the average investor. A popular gold ETF has temporarily suspended new share issuance due to surging demand for gold. Tom Cloud explains how this and other key factors are bullish for gold. Exclusive Interview: Jerry Robinson is joined by David Morgan, an expert and veteran investor in the silver market, to discuss the recent breakout in silver prices and David’s new business venture. The last time the Gold-Silver Ratio rose above 80, the price of silver broke out over $47 (and the ratio fell to 35:1). Tom Cloud explains how this key technical factor is very bullish for silver investors. With more pension plan woes developing and a continued zero interest-rate policy, more investors will begin seeking safe-haven assets, including gold. Tom Cloud discusses how these events will impact precious metals prices. Barry James Dyke joins us to discuss his latest book, Guaranteed Income: A Risk-Free Guide to Retirement. Plus, an expose of one of Wall Street’s dirtiest secrets they don’t want you to know. View our latest Market Barometer trend analysis and commentary on U.S. stocks and precious metals, along with buy/sell signals. This unique and powerful scan could boost your trading profits. Get our latest trend analysis ratings on more than 60 currency, commodity, and global ETFs each month. Subscribers only. Should You Get Your Gold Out of the U.S. Banking System? This week, Tom Cloud discusses the benefits of getting your precious metals holdings out of the U.S. banking system and creating your own physically-backed precious metals “ETF”. The following infographic brilliantly sums up one of the massive “sleeper” investments of 2015. When the numbers were all calculated, Bitcoin was easily the top performing currency of 2015. This week, Tom Cloud explains why this year could bring greater than normal risks for investors, but could also provide better than average returns. Tom Cloud, precious metals expert, explains how the interest rate hike this week should provide a golden opportunity for buyers of precious metals. Tom Cloud, precious metals expert, explains how possible interest rate hikes in the near future may keep gold prices investor-friendly. Tom Cloud, precious metals expert, explains how a rising dollar is causing precious metals prices to dip again. Tom Cloud, precious metals expert, says that big names in the precious metals business are predicting big jumps in gold and silver prices between now and March 2016. Tom Cloud, precious metals expert, explains how gold prices continue to be flat, sitting on the 200 day moving average. Tom Cloud, precious metals expert, says gold is up significantly since the first of September and could possibly go even higher this quarter. In this 65-minute video webcast, Jerry Robinson welcomes FTM Insider, Chris P., who has created $1,500+ in passive monthly income in less than six months using raw land deals.